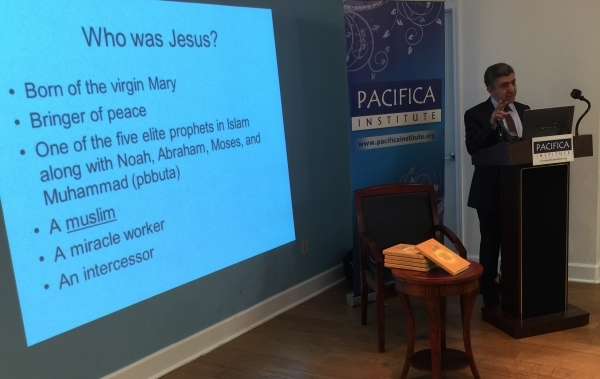 Pacifica Institute hosted a breakfast talk with Prof. Zeki Saritoprak and the signing of his latest book, Islam’s Jesus. This book addresses the importance of Jesus and introduces different interpretations of his descent in Islamic tradition based on Quran and Hadith. Professor Saritoprak began his speech with presenting some aspects of Jesus’ birth and his importance in Islam. Islam is the only religion that agrees with Christianity with regard to the birth of Jesus, that is was a divine miracle, said Prof. Saritoprak. He continued his speech explaining the verses in Quran about Jesus. Muslims regard Quran as their primary and infallible source. Therefore, anything cited in it is considered divine and important. Regarding to Jesus, by the Quran, a chapter is named after him (chapter 61) and he is mentioned more than 90 times, in many names, but most frequently in the title Ibn-Meryem, the son of Mary. Quran describes Jesus as a prophet and a “muslim”, with a lower case “m,” adds Prof. Saritoprak. Meaning that he had submitted himself to the will of God. As for the Gospel, Quran uses the name “Injil” with a singular form, indicating that there is just one Gospel. In addition, Quran refers to the Gospel (Injil) as a book containing guidance and light. Even though there are not solid verses inferring a second coming of Jesus in the Quran, there are many Hadith -the second source of Islam- referring to such an event. Prof. Saritoprak continued explaining Jesus with Hadith with quotes of the Prophet Muhammed. In many Hadith, similar to Quran, Jesus is described as the peace-maker. In one hadith, Prophet Muhammad mentions in his dream seeing Jesus circumambulating the Kaaba on the shoulders of two men. He says that Jesus was a man of brown color and had long hair reaching his shoulders, and water was dripping from his hair. Prof. Saritoprak highlights some symbolic meanings in the hadith: water representing his purity. Concerning the second coming of Jesus, one hadith indicates: “Surely Jesus the Messiah will find some people from among my community [ as his helper] who are like you or even better than you. God will not disgrace a community of which I am the beginning and Jesus the end.” Prof. Saritoprak addressed the importance of Jesus in the Islamic community. This second coming of Jesus is interpreted in many ways in Islamic tradition; some regard it as a belief adopted from Christian culture, some believe that Jesus will literally come down from the heaven, or the sky, and some believe in it in a metaphorical way, continued Prof. Saritoprak. He extended his speech based on the metaphorical perspective. Since Arabic language contains many allegorical and symbolic meanings, many scholars described Jesus in many different ways. In Sufi literature, Rumi wrote about the power of Jesus’ breath, aka his message. Muhammad Abduh described Jesus’s messages as commanding mercy, love, and peace. Last but not least, Said Nursi said “To love love and to hate hatred.” similar to the teachings of Jesus as the prophet of Love. Said Nursi expanded his interpretation on the descent of Jesus, and suggested that it indicates the beginning of a dialogue between Muslims and Christians to bring justice and peace to our world and a renewal of Christianity and a return to the original message of Jesus. Prof. Saritoprak points out the fact that Nursi foresaw the start of interfaith dialogue back in the 1910’s, just before the climax of horror, World War 1. Around the conclusion, Prof. Saritoprak refers to the importance of dialogue in the Quran. “ Say this [Muhammad] ‘ O people of the Book, come to a common word between us; that all of us worship none but God.” (3:64) People of the book cover up about 50% of the world population. And the cooperation of this large amount is enough to make changes for the better, he indicates. However, by no means anyone has to sacrifice their identity, he adds. “If God willed, He could have made you one community…” (5:48), therefore not everyone has to be the same, but should learn from one another. The talk concluded with Mr Saritoprak’s booksigning and conversation with the audience.